So Ireland has voted down its restrictive abortion laws. Now, it seems unlikely that the Emerald Isle will become as lenient regarding “pregnancy termination” as England already is. Yet perhaps someday, we’ll realize they just took longer to get to the same place. So getting an abortion in the UK is more difficult than it is in the US–which requires no doctors’ signatures and has no gestational time limit. In America, a woman can get an abortion for no reason until “viability”–24 weeks–and for any reason after that. By comparison, France allows abortion for any reason for only 12 weeks–and later only in extreme cases. The vote last week affected the law in Ireland–but not the laws of its neighbor–Northern Ireland, which is part of the UK but has the right to self-government. Northern Ireland’s demographics are much different from the rest of the UK. Northern Ireland is still a very divided nation–divided over religious tradition. But abortion may become a unifying factor if there is a push to change the law there too–especially in light of the recent UK cases of Alfie Evans and Charlie Gard–children who were British citizens allowed to die from lack of care from England’s National Health Service (NHS). Because there isn’t a very big leap from killing children at one age and killing older people at another. For example, there is the case of Simon Fitzmaurice–an Irish victim of ALS who breathes today but against the will of the NHS. Fitzmaurice’s medical attendants did not know the rules when they placed him on life support. Once they realized their mistake, he refused their urging to have himself removed from his breathing apparatus. A non-government agency provides such tools at no cost to patients or British taxpayers. Yet they urged him to let himself die. He is one they missed. But there will continue to be others. Here’s hoping another country divided on doctrine–but united on the sanctity of life can awaken the rest of the world. Freedom from tyranny stands in the balance. 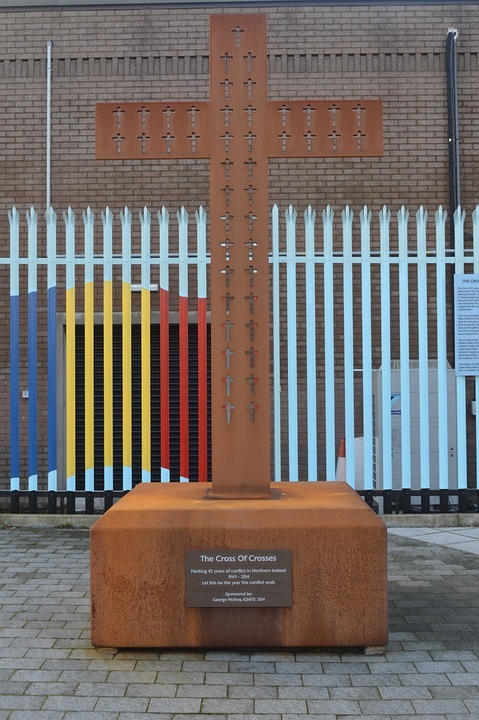 The Cross of Crosses (pictured above) represents 45 years of conflict between Protestants and Catholics in Northern Ireland–one cross–for each year someone died in the conflict–cut out of the larger cross. “The one cross represents the fact that one has died for all, namely Jesus Christ himself, that he died for both communities (Catholic and Protestant),” says Pastor Jack McKee. Very informative. I pray for lasting change and open eyes for the Irish people. Prayer is the key, our best hope–Yvonne. Thanks for commenting! God bless! So sad that Ireland sleeps. And this, “Because there isn’t a very big leap from killing children at one age and killing older people at another.” Such an atrocity. Thanks for this informative post and for addressing these kinds of issues, Nancy. It seems that not only America is in need of revival and God’s truth, but everywhere in the world! Certainly, the West is. In the East, people are coming to Christ in great numbers! Thanks for commenting! God bless! Thanks for spreading awareness about this! It’s so important to stay up-to-date on these kinds of topics so we can talk about them while educated instead of just with heated emotion. That’s right, Emily! Blowing heat at people does nothing to change their hearts or minds. Showing them reality can sometimes do that. Thanks and God bless! I didn’t realize America had some of the loosest laws regarding abortion. It’s such a big issue, determining how we best support life, both before birth and after. For me, I know I need to look at how we respond as a family as we support friends and foster kids. Sometimes we just can’t rely on the government. So, so true, Annie! God didn’t call us to develop a government to take care of people. And we see how expecting government to do that leads us to England. God calls us, the Church, to do his work. To care for anyone and everyone in true need. This is a very informative article, Nancy. I knew the US was very pro-abortion, but I don’t think I ever looked into the laws of other countries on this matter. Yes, US laws are horrible. But human life is sacred and precious at all stages of development in every nation. God bless and thanks for commenting! Thank you Nancy for this very informative article. Thank you, Jo Ann, for reading and commenting! God bless! Heartening and saddening. Thanks for this well-considered update, Nancy. Praying for the nations of my ancestry (and for my own). And of my own ancestry as well. Thanks, Mitch. God bless us and the homeland. This is a great piece – very informative, and you’ve backed it up with some shocking statistics! If Ireland is sleeping, America seems to be in a coma when we compare our lenient laws to theirs. Thanks for writing this! Thanks for reading and encouraging! God bless! May God continue to watch over the leadership in countries where they make decisions that are literally the not so thin line between life and death. Thanks for participating. Not so thin line–very insightful! Thank you for bringing our attention to this important topic. Yes, praying is one of the powerful weapons we have. Thank you, Edna! Keep praying! God bless! Somehow it is sad that there need to be different laws. All life is sacred and should be protected. Good you did write about this issue, good to think about. Next PostNext Population Control Worked–Or Did It?